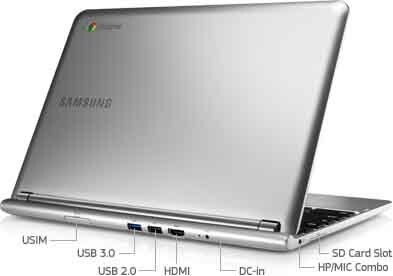 How do I connect my Chromebook to an external monitor or TV? You can connect your Chromebook to a monitor or TV by using the Chromebook’s HMDI port. After you have connected your Chromebook to a monitor or TV, you can extended your desktop across multiple screens or mirror your Chromebook desktop onto a larger screen. To connect a monitor or TV to your Chromebook, plug a HDMI cable from your monitor or TV into the HDMI port on your Chromebook. If your monitor or TV does not have an HDMI port, it may have a display Port, DVI, or VGA port. If this is the case, the instructions included with your Chromebook will tell you what type of adapter you need. Using the drop down menu to rotate the image on your separate monitor. You can move your viewing area by pressing the arrow and shift keys until you are satisfied with its alignment. Check the box for Enable Unified Desktop mode.